Finally some pictures on my personal blog :-). I am still keeping a lid on the abundance of pics to be uploaded but oh well ... at least some pics here on what I am currently doing or going to do. 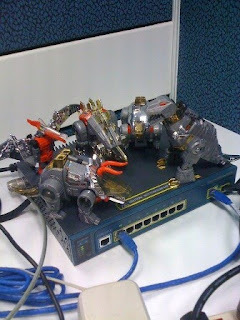 All five Dinobots on a Cisco 3560 switch (8 ports version) at the office. Grimlock, Slag, Sludge, Snarl and Swoop got pretty tired on playing with Optimus Prime and the Autobots so they decided to play a man's game and started off small with a mini layer-3 switch. Dunno what are the Dinobots? Go watch the Transformers G1 cartoon not the movie with Megan Fox in it. 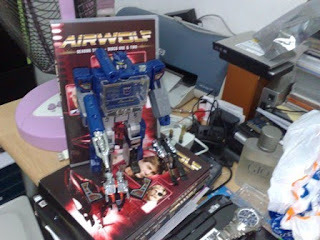 Soundwave with Ravage and Laserbeak looking pretty good conquering my latest purchase from eBay. The three seasons of Airwolf (the fourth season of Airwolf isn't really Airwolf if you get my drift) which I have been trying to get hold of for the last two years! Having a headache trying to think of Cisco stuff. 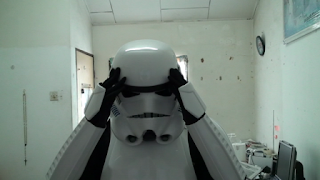 It's not easy being a Cisco-certified StormTrooper. You need to think of the routing protocols and also think of how to please Darth Vader's growing appetite to implement IPv6. 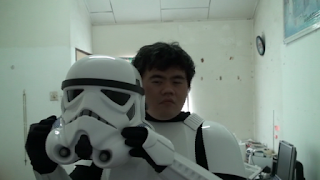 This is the StormTrooper armor that I got from eBay. The suit still needs a lot of modding to it though like making the armor allowing me to pee and also actually sit without the pieces cutting into my skin. Inside the cool StormTrooper suit lies a crazy self-confessed geek.